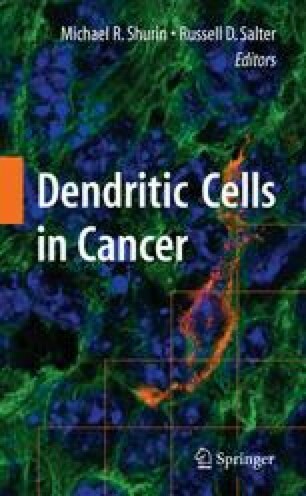 Dendritic cells are neither the most obvious nor the most abundant cells in lymph nodes, but are certainly among the most immunologically influential, acting primarily as highly potent professional antigen-presenting cells that control complex sequences of innate and adaptive immune responses. Immune responses against tumors, immune resistance, and tolerance are initiated in tumor-draining lymph nodes, including sentinel lymph nodes where mature dendritic cells present processed tumor antigens to naïve T cells generating tumor-specific cytotoxic and helper T cells. Dendritic cells in sentinel lymph nodes of cancer patients have maturation defects that influence their function and phenotype. Lymph nodes contain follicular dendritic cells and paracortical dendritic cells (interdigitating dendritic cells). This chapter deals exclusively with the latter. The topic is a research interest for the authors who have published previously on the topic and this review draws extensively on these prior publications.